What Should You Wear for Sangeeth Ceremony? Indian wedding ceremonies are absolutely fun to attend. The celebrations start days and sometimes week before the Big Day. Various ceremonies such as engagement, haldi ceremony, mehendi ceremony, baarat, wedding and receptions are again followed by post – wedding functions keep the near and dera extremely busy during these days. Indian weddings are no longer the conventional ceremonies dating back to time immemorial, they have moreover drastically changed and have become stylish affairs like never before. These days, plans of weddings are followed by high oomph and with a must-have glamour quotient. These days the sangeeth events are being organized by Sangeeth Organizers Apart from the age-old customs and rituals, which are still being followed in Indian marriages, people have made this social function a lively affair with lots of entertainment, fun and brouhaha. Entertainment has become the soul of Indian marriages now, be it in form of feast, gala, mehndi, sangeet ceremony or reception. Sangeet and mehndi ceremonies are two both important ceremonies which are celebrated with much fun and enthusiasm. While some families intend to make it a lavish affair to show off their aristocracy, others simply believe in enjoying to the fullest irrespective of the venue. But in all cases, one thing that is taken care of is the outfit. Girls always love to dress up fashionably for such occasions. From wearing bridal inspired lehengas for sangeet, women wear fancy hairstyles for sangeeth ceremony too. These hairstyles may not by as fancy as the Bridal hairstyles, but these are a little more simple yet look chic on the brides and the bridesmaid. But girls should be careful in choosing their outfits for this occasion. The first thing they need to take care is of comfort. Since they would be dancing to the music the entire time, they should wear something that gives them comfort and freedom to dance freely. Next comes the theme. While some Sangeet ceremonies have a theme of Qawali nights and Ghazal evenings, others are purely set on Bollywood music and Retro nights. 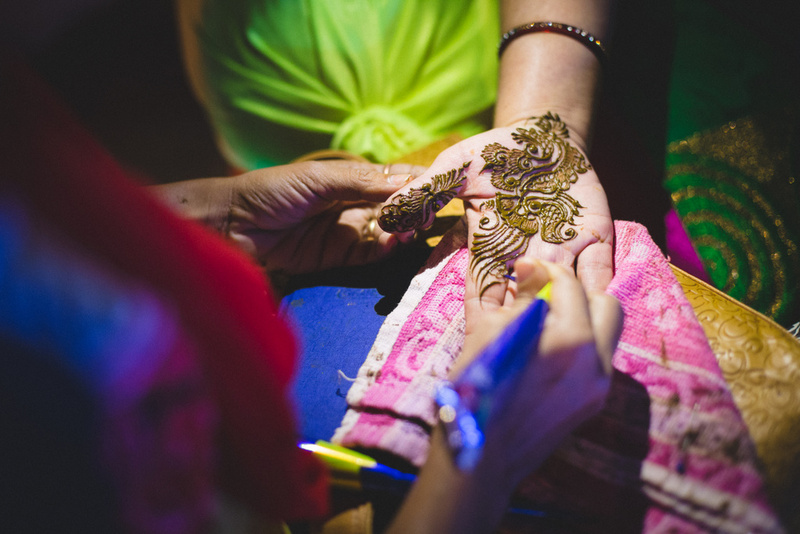 With all those specialized themes being followed in different marriages, the dress, hairstyles for the sangeet ceremony (keeping in mind the dance and fun), including food, décor, music, choreography etc. are made to revolve around the same. Many opulent families opt to invite professional Qawali, Pakiza and Ghazal singers for making the Sangeet more natural and lively. While youngsters show more interest in Bollywood music, elders prefer to enjoy it in a more sober manner, listening to the Ghazal singer followed by the “Wah-Wah’s” in between with a glass of wine/whiskey. Tips for dressing to Sangeet from the best event management company in Hyderabad. The would-be groom can take stole/dupatta on their kurta to add a casual touch on their formal look. You can enhance your eyes with brown colored matt eye-pencil If your kurti is silver color then go for a center parting pony.